The quake followed a strong foreshock measuring 6.2Mw which occurred 9 minuets earlier. Magnitude 6.5, MICHOACAN, Mexico; Wednesday, April 11, 2012 at 22:55:10 UTC; 18.272°N, 102.732°W; depth of 20 km (12.4 miles); USGS NEIC. Magnitude 5.9, OFF THE COAST OF OREGON; Wednesday, April 11, 2012 at 22:41:47 UTC; 43.593°N, 127.557°W; 271 km (168 miles) W of Coos Bay, Oregon; depth of 10.2 km (6.3 miles); USGS NEIC. 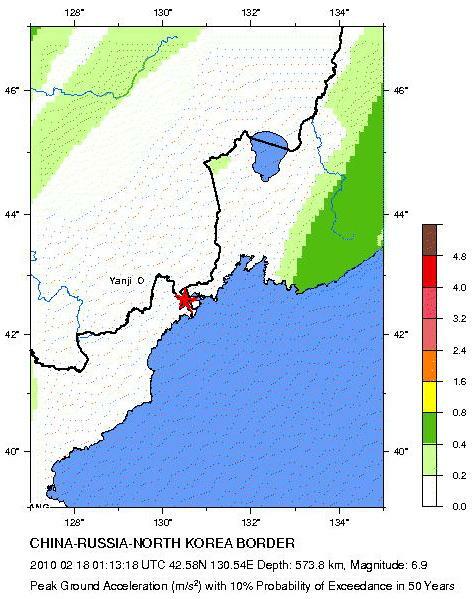 A powerful quake measuring up to magnitude 7.0 Struck near China-Russia-North Korea border region (42.7ºN131.1ºE) on Thursday, February 18, 2010 at 01:13UTC, at a depth of about 590 km. The quake was felt as far east as the eastern coast of Honshu, east of Tokyo, Japan’s Meteorological Agency (JMA) reported. The event was the 12th earthquake measuring between 7.0 and 7.8 to strike the region since 1900, and the fourth such event since 1990, according to USGS earthquake data. 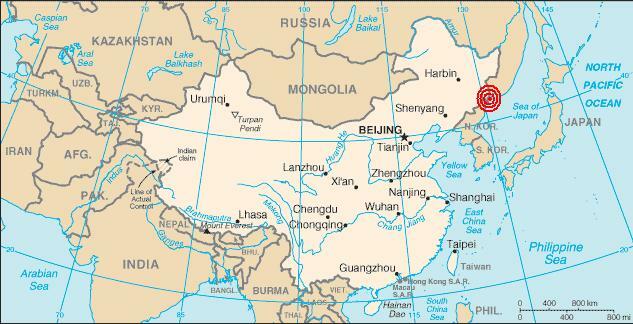 The quake epicenter appears to be located in sparsely populated Chinese territory. It too deep to cause any tsunami, or major damage to the nearest major cities of Vladivostok, Russia, and Chongjin, North Korea. As of posting, there was no report of injuries as a result of this event. Political Map of China. Click images to enlarge. Since Wednesday, October 07, 2009 at 22:03 UTC, about 11 hours from time of posting, a total of 19 shocks have struck Vanuatu and Santa Cruz Islands Regions. The Mainshock which measured up to 8.2 Mw struck Vanuatu region, followed by 18 additional shocks in the two neighboring regions. Magnitude 7.9 earthquake struck southern Sumatra, Indonesia, 50 km (30 miles) WNW of Padang, at a depth of about 85 km on Wednesday, September 30, 2009 at 10:16 UTC, USGS/EHP reported. 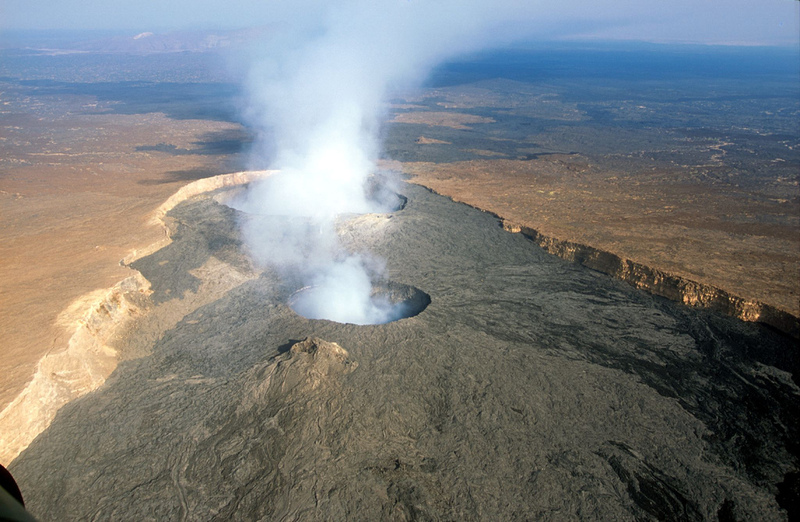 Only hours ago, having briefly analyzed details of the Samoan earthquake, FEWW had foretasted that up to 3 more powerful quakes could strike the Pacific Ring of Fire in 2009. Four weeks ago a deadly earthquake measuring 7.3 to 7.6 Mw struck off the coast of Java, Indonesia, killing more than 80 people and injuring at least another 1,250. Pacific Tsunami Warning Center (NOAA) has issued a tsunami warning based on the size and location of the earthquake for countries bordering Indian Ocean: Indonesia, India, Thailand and Malaysia. “People are panicking. They are running out of the buildings… There are many collapsed buildings,” an eye-witness in Padang told a local TV station. “Hundreds of houses have been damaged along the road. There are some fires, bridges are cut and there is extreme panic here maybe because water pipes are broken and there is flooding in the streets,” another witness told Reuters. “Hundreds of houses have been damaged along the road,” another eye-witness in Padang said. Padang has a population of just under 1,000,000 people. There were no reports of casualties as of posting; however, given that so many buildings have collapsed, it’s more than likely that many people would have been killed or injured. According to a local report, power and phone lines are down in Pandang and several other parts of Indonesia. The mainshock was followed by a strong aftershock measuring 6.0 GFZ Potsdam/ Earthquake Bulletin reported. More strong aftershocks are highly probable. A large earthquake east of Honshu, Japan Region, may be imminent (in the next few hours).